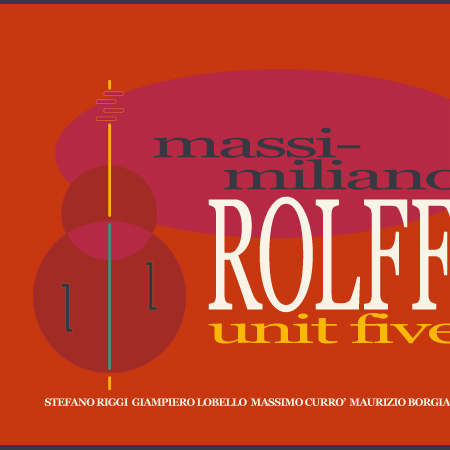 It is a great pleasure, a year after the record debut, published by this well-deserving label, of drummer Carlo Milanese (Intermission, Music Center BA 087 CD), to introduce the first work as leader of another young and well prepared musician, the bass player Massimiliano Rolff, leading his band named Unit Five. Yes, it’s always exciting to write and especially to listen to musicians like Massimiliano and his fellow artists on this record: young players very well grounded and already experienced in performing with some of the best names in the scene. But the most important thing above all is that these musicians can express the authentic language of jazz. In our days, when many musicians prefer to show off their technical skills writing intricate melodies without any swing, it is not so easy to find musicians that give more importance to a phrase or to their stylistic coherence. This is one of the strongest points in Massimiliano’s work: he’s been able to choose the right musicians and to write all the pleasing tunes in this album, letting each band-member express himself both individually and within the group. From the initial Unfaithful, through All Natural and again in Wind Blow we can appreciate Stefano Riggi building valuable solos with the strong and distinctive tone of his tenor sax, just like Giampiero Lo Bello’s shining trumpet in evidence on Didi, and skillfully muted in Corner Stomp, or with the mellow sound of his flugehorn played in the ballad Stones And Memories. The rhythm section plays its fundamental role with the guitar of Massimo Currò both as accompanist and soloist, as he shows on Theo’s Move and Thanks God, It’s A Sunny Day, and with the precise, tasteful swinging drum performance by Maurizio Borgia. I intentionally left until the end my thoughts about the leader, Massimiliano Rolff, who through this first work clearly defines his various and certainly uncommon qualities. Besides having an excellent sound, perfect timing and being a great soloist – as you can hear all throughout the album – Massimiliano shows he’s a real leader, writing and arranging with taste and method, leading a band like this where every little detail is taken into full consideration. One more time – and I’m sure there will be more – dear friends who love true jazz just like me, don’t worry: the future is in good hands!